The Way of The Flower featured a program of contemporary works for shakuhachi and koto. The concert opened and ended with two well-known 20th century compositions by Sawai Tadao: Flying Like a Bird (1985) and Song of the Waxing Moon (1979). Brandon Lee’s performance of Flying Like A Bird delivered a captivating experience: The sounds, the noises, the tone colours and the varied dynamics from the koto impressed listeners with an exquisite floating soundscape in the air. After the opening piece, the program moved away from the Japanese heartland of the instruments to feature four 21st century works by non-Japanese composers: Rain Now and Then(2011) for shakuhachi solo, Far Below Me(2015/2019) for shakuhachi, spoken word, and bass koto, and Moon in Water (2018/2019) for shakuhachi and voice by Australian composer-performer Anne Norman, and I Thought About Eva (2018) for shakuhachi and koto by French composer Henri Algadafe. Anne Norman performed her three original compositions with utmost mastery. Rain Now and Then showed a stream of beautiful melodies. Far Below Me incorporated alternating sections of spoken words and shakuhachi, supported by the deep and mellow sounds of the bass koto. In Moon in Water, the technique of incorporating voice while blowing the shakuhachi created a mesmerising experience: the voice within the music and the music within the voice. In both Far below Meand Moon in Water, the spoken or sung poetry brought an extra-dimension to the musical experience. Henri Algadafe’s work with contrasting sections grown from five occurrences of a short motif provided an opportunity for both the shakuhachi and the koto to deliver brief but musically meaningful gestures interacting with each other to bring about a thoughtful outcome. The program ended with Tadao’s Song of the Waxing Moon(1979) which was presented simultaneously with an ikebana demonstration by Shoso Shimbo. The juxtaposition of two elements made Tadao’s work the background music for the ikebana session. While one could appreciate the ikebana process in the musical atmosphere, it is more desirable for the audience to have the opportunity to listen to the musical work by itself as a way to honour Sawai Tadao. As most members of the audience had already seated 15-20 minutes before the concert, the ikebana session could have started then in silence. The sound of the scissors, the breaking of the branches and the footsteps of the ikebana master are the music of the flowers in itself. The Adjustable Microtonal Guitar was designed by Turkist guitarist Tolgahan Çoğulu in 2008. This microtonal guitar allows players to easily change positions of frets, and to add/remove fret(s) to tune the instrument to various microtonal scales. This flexibility in micro-tuning opens incredible opportunities for guitarists to expand their music beyond the restriction of the Western scale of temperament. This is an amazing contribution to the development of the classical guitar and its music. In this video, Tolgahan Çoğulu introduces the main features of his 8-stringed adjustable microtonal guitar and performs various pieces. Not All Who Wonder Are Last is the second CD of the Melbourne-based string trio Bowlines. In this CD, listeners encounter the new line-up of the ensemble: Ernie Gruner (violin/viola/octave violin), Hope Csutoros (violin), and Helen Mountfort (cello). The whole CD is a live recording of a Bowlines’ performance in Brunswick, Victoria on 30th October 2016. 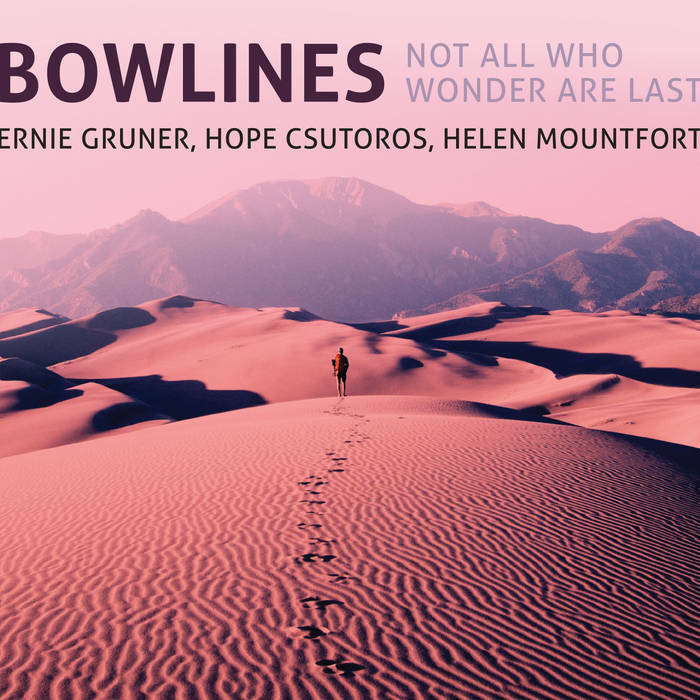 Drawing elements and inspirations from various sources, including classical and world music, Bowlines created an improvised cross-genre music that offers listeners many magical moments. While four short tracks (Rowing into Sunlight, The Traveller’s Dog, Over the Hills to Faraway, and Unexpected Descent) are built on a single musical idea/gesture, longer tracks are beautifully crafted to reveal to the listeners the audio essences of feelings or imagined situations. The CD demonstrates Bowlines’ mastery of story-telling in sounds with lively gestures, dazzling rhythms and charming melodies. Their music flows easily from moments ot moments, from one idea to another, and from earthy folk elements to classical and theatrical textures. It is a joy to listen to the CD in its entirety as a grand suite of improvised moments. The whole CD can be sampled online at Bowlines’ Bandcamp site. Mantra T is the musical setting of the Tibetan Buddhist mantra Om Mani Padme Hūm associated with Avalokiteshvara (Tibetan: Chenrezig). Literally, the mantra means “Om, jewel in the lotus flower, Hum (Om is a sacred syllable ; Hum represents the spirit of enlightenment). This mantra is also popular in Mahayana Buddhist traditions. It provides protection as well as a guidance for spritual seekers to start their quest internally. The first section is a paraphrase of the Tibetan traditional chant. The second section is an improvisation on the sounds of the mantra. The vocalisation of the mantra is punctuated with the sounds of Vietnamese gongs, Japanese bells and taiko. Mantra T thể hiện âm thanh của Lục Tự Đại Minh Chân Ngôn “Úm Ma Ni Bát Ni Hồng” của Quán Thế Âm Bồ Tát qua tiếng trì niệm, chiêng Việt, chuông và đại cổ Nhật Bản. Úm Ma Ni Bát Ni Hồng có thể dịch là: Om, ngọc quý trong hoa sen, Hūm. Om là thánh âm của vũ trụ, và Hum biểu hiện tinh thần giác ngộ. Ngoài sự gia hộ cho những người trì niệm, chân ngôn này cũng chỉ rõ phương pháp chuyển hóa tâm linh là hướng về bên trong. Speak Percussion is the Australian percussion ensemble that has re-defined the sounds of percussion music and the potential of percussion. Speak Percussion is internationally recognised as a leader in the fields of experimental and contemporary classical music. Many of its performances are impressive in both visual and musical aspects. Between 23 and 25 November 2016, Speak Percussion presented the Australian premiere of its 2015 touring project Fluorophone. “Fluorophone creates a kaleidoscopic sound world in which the central instruments radiate, flicker, glow and burn. Analogue and digital fluorescent lights, the naked flame, strobe lights and custom-built LED discs are combined with percussion to create a program in which the music and lighting design are one and the same. Fluorophone moves between noise, theatrical music and virtuosic instrumentalism, in a synesthetic display of light and sound. Featuring specially commissioned works by a prominent team of leading composers”–Program notes. Fluorophone features works by Juliana Hodkinson, Simon Loeffler, Eugene Ughetti, and Damien Ricketson. Tunnel Number Five is one of the underground oil storage tunnels created in Darwin during the World War II. At the depth of 15 meters, the 172 meter-long tunnel is a space of incredible resonance and acoustic qualities. The Tunnel Number Five Festival of Underground Music is an annual event that brings together professional independent musicians from across Australia to the Northern Territory to provoke the creation of new music in new combinations of artists. Sarah Hopkins (cello, overtone singing ); Jason Guwanbal Gurruwiwi (manikay ); Henk Rumbewas , Amanda Rumbewas, Sebastian Guyundula Burarrawanga, Anne Norman, Adrian Gurruwiwi , Netanela Mizrahi (choirchimes); Ernie Gruner, Cathy Dowden, harmonic whirlies. releases more bubbles, and a rainbow appears. the tiny island of Ganalawurru, the seagulls of the Djambarrpuŋyu clan. shakuhachi and Henk’s rich voice singing: Awino oooh! Oh! Mother. A selection of live recordings from the 2016 Tunnel Number Five Festival of Underground Music has been released on the digital album & CD Up from the Deep. Listen to all tracks from this album online at BandCamp.